Turner and IMG's ELEAGUE, in partnership with Warner Bros. Interactive Entertainment, will kick off the group stage of the first-ever ELEAGUE Injustice 2 World Championship presented by PS4, with eight players facing off for two spots in the Championship round. 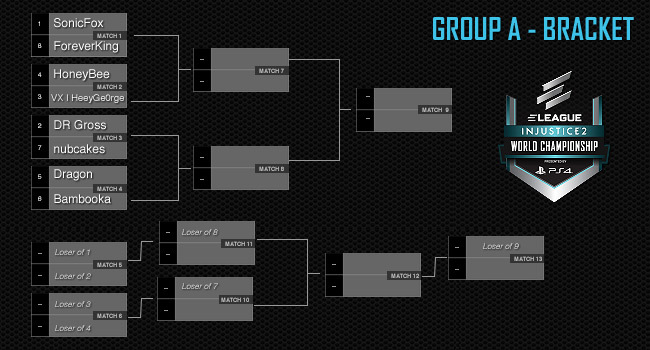 Live Group A coverage will include a showcase of the bracket's final matches, Friday, Oct. 27, at 10 p.m. on TBS. Fans can follow live digital coverage of the group's first matches beginning Friday at 6 p.m. across Twitch, ELEAGUE.com and YouTube. The game’s consensus top-ranked player, Dominique “SonicFox” McLean, will highlight live Group A competition. SonicFox boasts over $400,000 in career fighting game winnings, and comes to ELEAGUE after his latest tournament win in the Injustice 2 Pro Series finals. Christian "ForeverKing" Quiles – who advanced from the Last Chance Qualifier – will be the first to challenge SonicFox in the best-of-five, double-elimination group stage. The World Championship will provide a thrilling conclusion to the debut season of the Injustice 2 Championship Series – with 16 of the game’s most accomplished players, including two from the Last Chance Qualifier – competing for $250,000 in prize money. Players will use the game's iconic DC Universe characters, including Batman and Superman. Live TBS coverage will continue Friday, Nov. 3, at 10 p.m. with Group B, followed by the Championship round at the same time on Friday, Nov. 10. Live Twitch coverage will begin at 6 p.m. for both Group A (Oct. 27) and Group B (Nov. 3), and at 10 p.m. for the Championships (Nov. 10).